This tour takes to Nyungwe forest in South West of Rwanda, a huge afro-montane forest. With over 10000sq.km in size, Nyungwe is the undisputed giant in Central Africa. The natural forest is renowned for its large troops of colobus monkeys, chimpanzees, butterflies and a rich variety of orchids. Over 300 bird species have been recorded. Visit some cultural sites en route - the Museum in Butare and the palace at Nyanza. 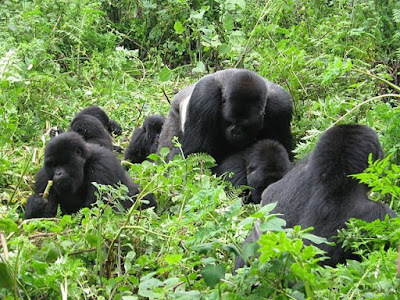 Visit Parc National des Volcans (PNV) in the north of Rwanda where about 300 mountain gorillas live. You can track gorillas, climb the Visoke volcano, track the golden monkeys or visit the Karisoke Research Centre, which Dian Fossey the famous climatologist set up, or visit local villages. Day 1: Arrive at Kanombe ( Kigali) airport. Meet, greet and start for Nyungwe Forest National Park. Low Budget: Gisakura guest house. Guided nature walk in the forest to see a variety of animals and some of the three hundred bird species found here, which include the Rwenzori turaco and black and white casqued hornbill. Go on an escorted walk in search of large groups of colobus monkeys - sometimes as many as 400 in a group. OR go chimp tracking. Picnic lunch. Return late afternoon. After breakfast, drive to Gisenyi. The Kibuye - Gisenyi route is via the most beautiful panorama with tea plantations and glimpses of Lake Kivu. Arrive at Gisenyi in time and check in at accommodation and the banks of Lake Kivu. Spend the rest of the day at Gisenyi with optional tours including excursions to Gisenyi out skirts, including hot springs Overnight stay at your hotel (private arrangement) Boat ride: We can organize for a boat ride from Kibuye to Gisenyi. Day 4: Transfer to Kinigi Park Headquarters to track gorillas in Parc National des Volcans. Gorilla tracking through the forest, hills and swamps can be tough, arduous and tiring, sometimes taking up to 8 hours in the forest. But coming face to face with the great primates is well worth the effort. Following breakfast, you will leave for Kigali. You have the opportunity to visit the Gisozi Genocide Memorial Museum. The memorial is very moving – the tour takes a couple of hours - and will be of interest to anyone who has spent some time in this enchanting country. It is in memory of the multitudes murdered in Rwanda´s genocide 1994. The Memorial sites and centres are places of dignified remembrance for loved ones lost. It is also a place of reflection and learning for the wider community, both in Rwanda and internationally. Afterwards, you will be transferred to the airport.